With the increasing popularity of GraphQL technology we are summarizing some documentation and tips about common security mistakes. GraphQL is a data query language developed by Facebook and publicly released in 2015. It is an alternative to REST API. Even if you don’t see any GraphQL out there, it is likely you’re already using it since it’s running on some big tech giants like Facebook, GitHub, Pinterest, Twitter, HackerOne and a lot more. GraphQL provides a complete and understandable description of the data in the API and gives clients the power to ask for exactly what they need. Queries always return predictable results. While typical REST APIs require loading from multiple URLs, GraphQL APIs get all the data your app needs in a single request. GraphQL APIs are organized in terms of types and fields, not endpoints. You can access the full capabilities of all your data from a single endpoint. GraphQL is strongly typed to ensure that application only ask for what’s possible and provide clear and helpful errors. New fields and types can be added to the GraphQL API without impacting existing queries. Aging fields can be deprecated and hidden from tools. Before we start diving into the GraphQL security landscape, here is a brief recap on how it works. The official documentation is well written and was really helpful. Since Burp Suite does not understand GraphQL syntax well, I recommend using the graphql-ide, an Electron based app that allows you to edit and send requests to a GraphQL endpoint; I also wrote a small python script GraphQL_Introspection.py that enumerates a GraphQL endpoint (with introspection) in order to pull out documentation. The script is useful for examining the GraphQL schema looking for information leakage, hidden data and fields that are not intended to be accessible. Introspection is used to ask for a GraphQL schema for information about what queries, types and so on it supports. As a pentester, I would recommend to look for requests issued to “/graphql” or “/graphql.php” since those are usual GraphQL endpoint names; you should also search for “/graphiql”, ”graphql/console/”, online GraphQL IDEs to interact with the backend, and “/graphql.php?debug=1” (debugging mode with additional error reporting) since they may be left open by developers. “However, for a production codebase, delegate authorization logic to the business logic layer”. Things may go wrong, thus it is important to verify whether a user without proper authentication and/or authorization can request the whole underlying database from the server. When building an application with GraphQL, developers have to map data to queries in their chosen database technology. This is where security vulnerabilities can be easily introduced, leading to Broken Access Controls, Insecure Direct Object References and even SQL/NoSQL Injections. "Stack": "Error: invalid ID\n at (/var/www/examples/04-bank/graphql.php)\n"
Even though GraphQL is strongly typed, SQL/NoSQL Injections are still possible since GraphQL is just a layer between client apps and the database. The problem may reside in the layer developed to fetch variables from GraphQL queries in order to interrogate the database; variables that are not properly sanitized lead to old simple SQL Injection. In case of Mongodb, NoSQL injection may not be that simple since we cannot “juggle” types (e.g. turning a string into an array. 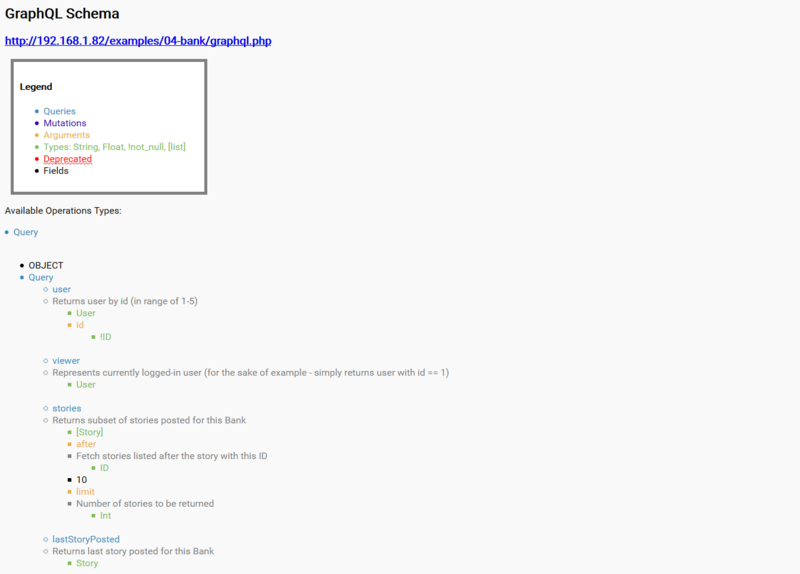 See PHP MongoDB Injection). An easy remediation against DoS could be setting a timeout, a maximum depth or a query complexity threshold value. We're hiring - Join Doyensec! At Doyensec, we believe that quality is the natural product of passion and care. We love what we do and we routinely take on difficult engineering challenges to help our customers build with security. We are a small highly focused team. We concentrate on application security and do fewer things better. We don’t care about your education, background and certifications. If you are really good and passionate at building and breaking complex software, you’re the right candidate. We are looking for a full-stack senior software engineer that can help us build security automation tools. If you’ve ever built a fuzzer, played with static analysis and enhanced a web scanner engine, you probably have the right skillset for the job. We offer a well-paid six-months collaboration, combined with an additional bonus upon successful completion of the project. We are looking for an experienced security engineer to join our consulting team. We perform graybox security testing on complex web and mobile applications. We need someone who can hit the ground running. If you’re good at “crawling around in the ventilation ducts of the world’s most popular and important applications”, you probably have the right skillset for the job. We offer a competitive salary in a supportive and dynamic environment that rewards hard work and talent. We are dedicated to providing research-driven application security and therefore invest 25% of your time exclusively to research where we build security testing tools, discover new attack techniques, and develop countermeasures. Top-notch in web security. Show us public research, code, advisories, etc. Spotlight is the all pervasive seeing eye of the OSX userland. It drinks from a spout of file events sprayed out of the kernel and neatly indexes such things for later use. It is an amalgamation of binaries and libraries, all neatly fitted together just to give a user oversight of their box. It presents interesting attack surface and this blog post is an explanation of how some of it works. Yet the crashes weren’t from the target. In OSX, whenever a file is created, a filesystem event is generated and sent down from the kernel. Spotlight listens for this event and others to immediately parse the created file for metadata. 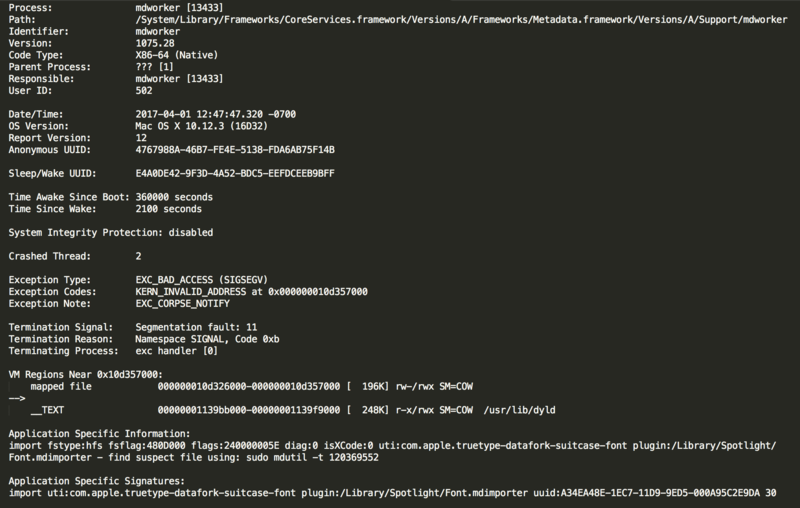 While fuzzing a native file parser these Spotlight crashes began to appear from mdworker processes. Spotlight was attempting to index each of the mutated input samples, intending to include them in search results later. The Spotlight system is overseen by mds. It opens and reads from /dev/fsevents, which streams down file system event information from the kernel. Instead of dumping the events to disk, like fseventsd, it dumps the events into worker processes to be parsed on behalf of Spotlight. Mds is responsible for delegating work and managing mdworker processes with whom it communicates through mach messaging. It creates, monitors, and kills mdworkers based on some light rules. The kernel does not block and the volume of events streaming through the fsevents device can be quite a lot. Mds will spawn more mdworker processes when handling a higher event magnitude but there is no guarantee it can see and capture every single event. The kernel filters which root level processes can read from this device. Each of the mdworker processes get spawned, parse some files, write the meta info, and die. 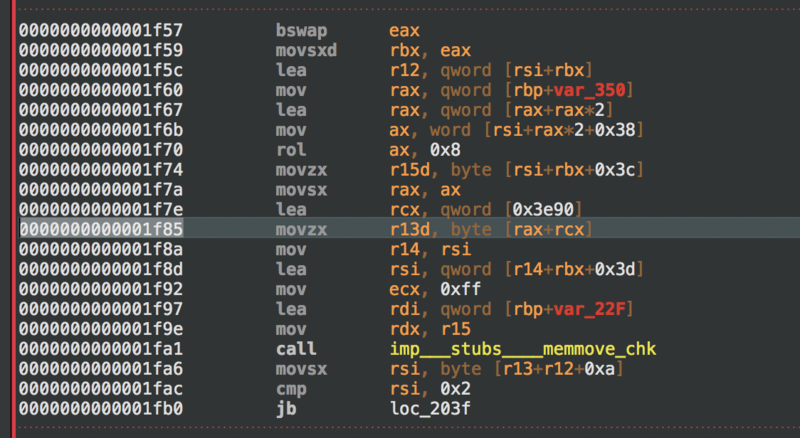 Mdworker shares a lot of code with mdimport, its command line equivalent. The mdimport binary is used to debug and test Spotlight importers and therefore makes a great target for auditing and fuzzing. Much of what we talk about in regards to mdimport also applies to mdworker. Importers are found in /Library/Spotlight, /System/Library/Spotlight, or in an application’s bundle within “/Contents/Library/Spotlight”. If the latter is chosen, the app typically runs a post install script with mdimport -r <importer> and/or lsregister. The following command shows the list of importers present on my laptop. It shows some third party apps have installed their own importers. These .mdimporter files are actually just packages holding a binary. These binaries are what we are attacking. Using mdimport is simple - mdimport <file>. Spotlight will only index metadata for filetypes having an associated importer. File types are identified through magic. For example, mdimport reads from the MAGIC environment variable or uses the “/usr/share/file/magic” directory which contains both the compiled .mgc file and the actual magic patterns. The format of magic files is discussed at https://developer.apple.com/legacy/library/documentation/Darwin/Reference/ManPages/man5/magic.5.html. The 2682437 is the iNode reference number for the file in question on disk. The -t argument to mdutil will ask it to lookup the file based on volume ID and iNode and spit out the string. It performs an open and fcntl on the pseudo directory /.vol/<Volume ID>/<File iNode>. You can see this info with the stat syscall on a file. The UTI registered by the importer is also shown “com.apple.truetype-datafork-suitcase-font”. In this case, the crash is caused by a malformed Datafork TrueType suitcase (.dfont) file. When we find a bug, we can study it under lldb. Launch mdimport under the debugger with the crash file as an argument. In this particular bug it breaks with an exception in the /System/Library/Spotlight/Font.mdimporter importer. The screenshot below shows the problem procedure with the crashing instruction highlighted for this particular bug. The rsi register points into the memory mapped font file. A value is read out and stored in rax which is then used as an offset from rcx which points to the text segment of the executable in memory. A lookup is done on a hardcoded table and parsing proceeds from there. The integer read out of the font file is never validated. When writing or reversing a Spotlight importer, the main symbol to first look at will be GetMetadataForFile or GetMetadataForURL. This function receives a path to parse and is expected to return the metadata as a CFDictionary. We can see, from the stacktrace, how and where mdimport jumps into the GetMetadataForFile function in the Font importer. Fuzzing mdimport is straightforward, crashes and signals are easily caught. The variety of importers present on OSX are sometimes patched alongside the framework libraries, as code is shared. However, a lot of code is unique to these binaries and represents a nice attack surface. The Spotlight system is extensive, including its own query language and makes a great target where more research is needed. When fuzzing in general on OSX, disable Spotlight oversight of the folder where you generate and remove your input samples. The folder can be added in System Preferences->Spotlight->Privacy. You can’t fuzz mdimport from this folder, instead disable Spotlight with “mdutil -i off” and run your fuzzer from a different folder.